How to integrate PayPal in ASP.NET? 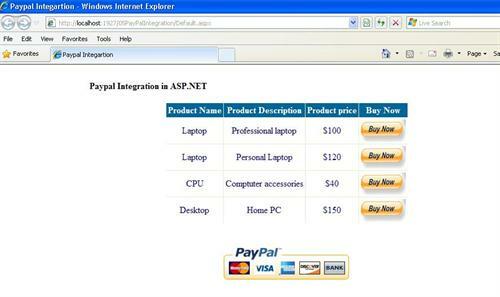 In this article , I am going to explain about how to integrate PayPal in ASP.NET. Most of website Seller to get money from the buyer through PayPal. Here I have explained in detail each step with screen shot. 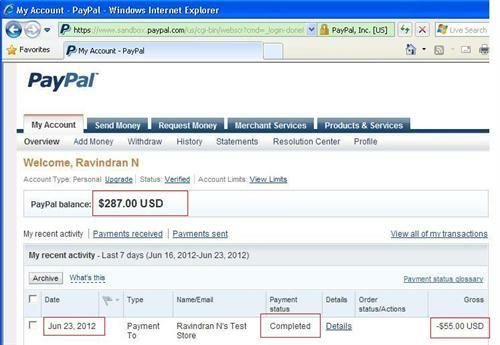 Here in this example I am used PayPal Sandbox site this is similar to live PayPal site. 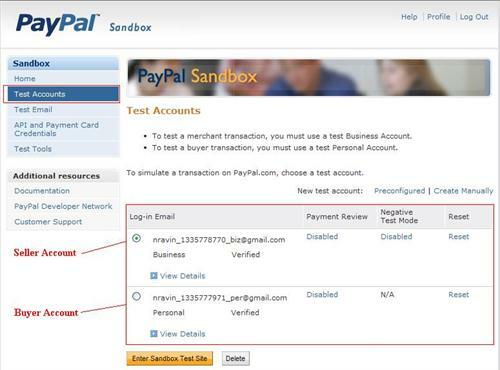 Sandbox is used to testing environment for developer provided by PayPal. After you tested just changed to Sandbox.Paypal.com to Paypal.com in PayPal Submit URL in web.config file that's all. That's fine now open visual studio and write coding to display product details and provide option to user buy our product through paypal. &LT;asp:GridView ID="GridView1" runat="server" AutoGenerateColumns="False" OnRowCommand="GridView1_RowCommand"
In the above url are local testing url after hosted in live changed your domain name in this values. Verify Details and click Paynow button. After that amount $ 55 USD deducted from your paypal personal account and increased $55 in seller account. After that automatically redirect to merchant site whatever URL you are configure in web.config file and insert transaction data in the table. If you not redirect to your website after payment complete then follow the below steps to set return URL in business account. d. Enable on Payment Data Transfer to get payment data return in website and save it. e. Again go to more option website payment reference and see identity token is generated (under payment data transfer) copy that identity token use it in the website web.config file. 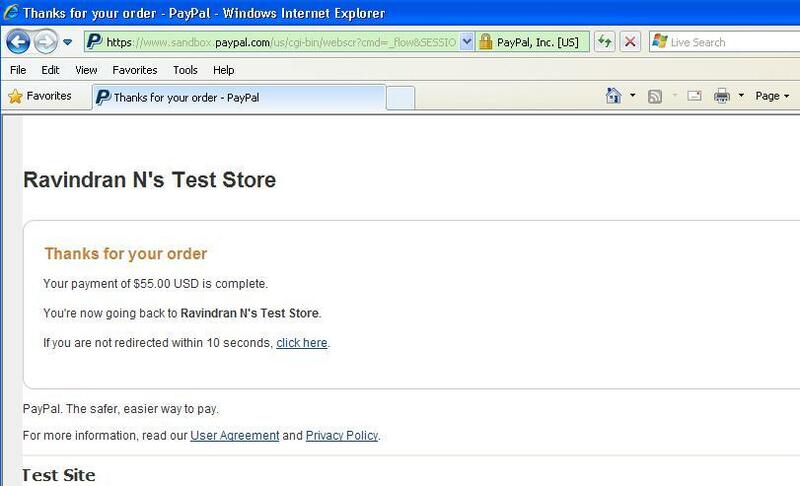 I hope this article is help you to know about integrate PayPal in your website. Not to the page that you have shown in the article. May I know where I went wrong? yes in that page paypal login is there? Steps to Execute Details Output below image....is appear after you redirect to that URL and make sure you must signin paypal account in the same browser. I have Logged in as per your suggestion but then I redirected to the Test Account page of the sandbox. and I have also gone through the document and i clicked on the enter Sandbox test site but there I don't find any Profile option. Can Please help me out? Login in https://developer.paypal.com/ and goto test account then choose "Business" account radio button then click "Enter sandbox test site". Enable on Payment Data Transfer to get payment data return in website and save it. Again go to more option website payment reference and see identity token is generated (under payment data transfer) copy that identity token use it in the website. At this time, we are unable to process your request. Please return to Vijay yadav's Test Store and try another option. Can you please tell me where i am wrong? And download my full source below resource to check it. Make sure you are change return url or success url as per your port or current website url in web.config file. I rewritted the code and changed the port in the web config file but still it redirects to the Error - return to Merchant page. ok I will email you. Nice Article, really helped out. the values comming from database values? thanks for solution but i dont understand that how to refund the payment can any one help me? i had a copy of ur article,its ran in fine way and i integrate this into my website too..
Can u please specify, when i host my website in live, what are the changes i supposed to do? and where i do those changes...explain this with ur example article..
Auto redirecting is not working Y??? This is best code of paypal integration.I could tranfer the amount from the buyer account to seller account.Now I want to integrate this on my live site.Should I create account on www.paypal.com since I want to only receive payment. To resolve this issue create a fresh business account but use the 'Create Manually' link instead of the 'Preconfigured' link. Once you have done that Vijay's instructions will work. Thank you Rav! Well done! This is the first tutorial (including PayPal official documentation) that I have tried that actually works from beginning to end. Don't miss ANY of the steps and it will work for you. Notes: 1. You must be logged in to PayPal sandbox on a separate tab when debugging the app. for it to work. 3. 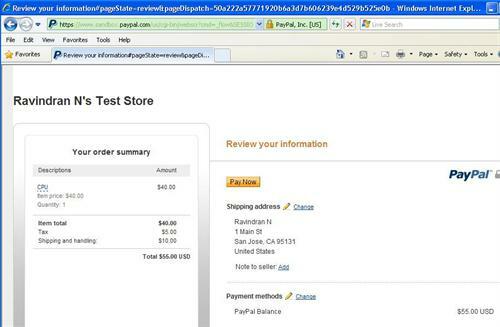 The "paypalemail" value is the seller Test Account email address NOT the API username - also found at the top of the Test Account Box. Thanks lot,This article helped lot for integrating paypal to my web site(Esente skin care medicine prodcut selling online). I need a help that,after click on PayNow button in paypal page,then i need to capture transaction ID and automatically redirect to success.aspx page in my site. Thanks For The article It worked perfectly fine. 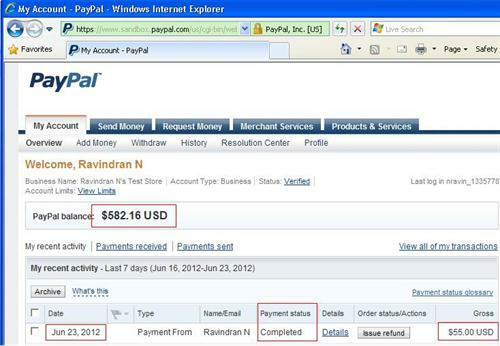 add key ="paypalemail" value ="nravin_1335778770_biz@gmail.com"
1-These examples are for a buyer with a paypal account. How can I have a buyer without paypal account(we have his info such as credit card number, expire date ,...) and we can pass all this data for transaction. 2- How can I have a buyer without credit card, I mean a person with just checking account (router number and account number) ? I want a code for online transaction through PayPal where users can login to site and make payments to each other. Please help for the code. Thanks for the post.You explain each step very nicely.Keep it up. Thanks for this great article, i have been searching for this for long time.The sample you have provided is working fine. I just want to know if any how i can get the transaction id for the completed transaction. Really Nice article. I have facing a problem to catch success value. This value return a null value. How can solve this problem. Please tell me ..how to get order id from PayPal in my application after purchasing. what will be database design. is it possible for transaction in Indian rupees. ? Hy, I have a hotel reservation asp.net project. I need paypal to integrate with it but I don't no how to integrate it. I want to send the total bill to paypal and want to do payment. Can you please guide me in it? Waiting for your positive response.